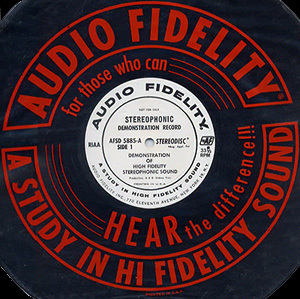 Label and sleeve from one of the first mass produced stereo records released in the U.S., by Audio Fidelity, their second stereo demonstration record. Realistic Tandy AM/AM Stereo receiver circa 1982, model TM-152. Stereophonic or stereo sound is by far the most common way we hear recorded music today. It is used on most CDs, radio programs, movies, television shows, and music downloads. It refers to the use of two or more recordings played simultaneously in order to achieve a more realistic and pleasing sound. Soon after the invention of the phonograph and the telephone, engineers reasoned that since we have two ears, the use of two sound sources instead of just one should give better results. In 1884, just a few years after the invention of the telephone, two microphones located in the Grand Opera building in Paris, and connected to “loudspeaking telephones” in other building, delivered a remarkably real-sounding, two-channel sound to listeners. The most obvious use for stereo was in music recordings, where the realism of the sound mattered most. However, inventors found it very difficult to adapt cylinder and disc records to incorporate two separate recordings. One possibility was to put two recordings into a single record groove by putting one recording on each wall of the V-shaped groove. Arthur Keller and I. Rafuse at Bell Laboratories and Alan Blumlein accomplished this separately in 1931 and 1937. However, playing back these recordings required prohibitively expensive special equipment. Stereophonic sound for the home would have to wait, but engineers found ways to bring stereo to the public in movie theaters. Using special equipment, the Walt Disney Film Fantasia was one of the first to feature stereo sound. Disney called it “Fantasound.” But it was so expensive to install the playback equipment in theaters that Fantasound was not used again. Only in the 1950s and 1960s would stereo make a return to theaters. In the meantime, stereo was given a boost by the introduction of tape recorders in the late 1940s. On tape, it was simple to record two, three, or more recordings side by side. Inventor Marvin Camras of the Armour Research Institute demonstrated one of the first stereophonic tape recorders, this one using three channels (left, right, and center) in 1949. When several manufacturers of home tape recorders began offering two-channel stereo tapes and machines to play them on in the early 1950s, it looked like stereophonic sound had arrived. But tapes were expensive, and many people had just purchased new equipment to play the LP and 45-rpm records. Once again, stereo had failed to catch on. A breakthrough came in 1958 when several record companies, including RCA and Decca, adapted the LP record for stereo playback. They used the two-in-one technology pioneered in the 1930s, where each wall of the groove held one of the channels. Backed by major electronics and record companies, stereo now became a hit. Recording engineers quickly discovered new ways of manipulating stereo technology in the studio. It was originally conceived of as a way of achieving greater fidelity, or realism. But many studios and musicians used it to create entirely new sounds. It was particularly effective in creating the illusion that an instrument or a voice was moving around the listening room. Because few people owned stereophonic record players in the late 1950s and early 1960s, record companies had to release nearly every new album in both the stereo and regular format (which now began to be called “monophonic”). This irritated consumers and record retailers alike. Playing a stereo record on your monophonic record player was sure to ruin the record, because the playing stylus was so different. Record store owners resented the fact that they had to try to stock different versions of each record. Practically nobody objected when the record companies discontinued monophonic records in the late 1960s. Since then, nearly every new music format has been in stereo from the start, including the cassette, the CD, MP3, and others. Although two-channel stereo is the standard form of the technology, “stereo” does not necessarily mean “two.” In the late 1960s, many record companies began issuing four-channel “quadraphonic” recordings. Usually, these were simply remixed versions of the original multi-channel studio tapes, where one or more instruments was moved from the original two channels to the new third or fourth channels. Now, instead of just a “left” and a “right” channel, one also heard music from both front and rear. “Quad” sound was briefly popular, but proved too expensive for average consumers. However, when multi-channel sound returned to theaters in the 1970s, often it had four or more channels, and the current “surround sound” home theater technology is similar to the quadraphonic systems of the early 1970s, but most frequently in the format known as 5.1, with five speakers, including a center front speaker for dialog, and a single sub-woofer to carry deep bass. The use of FM radio for broadcasting stereo sound came about in 1961. AM Stereo was trialled around 1951, but more recent competition with the older 'mono' AM radio broadcasting saw a number of AM Stereo systems trialed with the intent of clawing back market share of listeners. The rollout of AM Stereo was short lived. TV sound broadcast in stereo was .... and more recently on 16 June 2003 the French shortwave Digital Radio Mondiale (DRM) multi-media digital radio broadcasting implemented stereo broadcasts on the HF radio shortwave bands.